Weekend Kits Blog: Crystal & Glass Pearl Jewelry Making Kits! See our new selection of jewelry making kits in the Jewelry Kits section of the store! We have new product arrivals to share with you, including 3 new Crystazzi crystal & glass pearl jewelry kits from Cousin and a jewelry making starter kit from Darice. The Amber Glow Crystazzi Jewelry Kit includes a coordinated collection of lead crystal beads and glass pearls in beautiful amber tones. Each Crystazzi kit also includes a generous assortment of glass accent beads, metal jewelry findings, beading wire, and a project booklet. Crystazzi jewelry making kits include all the supplies you need to make 2 necklaces, 2 bracelets, and 2 sets of earrings! The 8-page project books gives step-by-step instructions for making each unique jewelry piece. A review of basic jewelry techniques is also included. 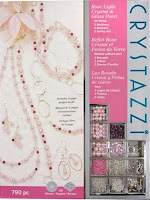 The Rose Light Crystazzi Jewelry Kit is a lovely collection of crystal and glass pearls in light rose tones. The instruction booklet provides instructions for 6 unique projects, including a large link necklace, double strand necklace, pearl toggle bracelet, double strand toggle bracelet, link earrings, and cluster earrings. There's also a Silver Mist Crystazzi Jewelry Kit featuring an elegant assortment of silver toned bicone crystals, glass pearls, metal beads, seed beads, silver findings, and beading wire. 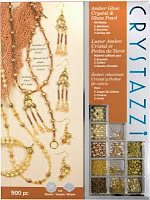 You'll need a set of basic jewelry making tools to complete the projects in the Crystazzi kits. The 3 basic jewelry tools required include wire cutters, round nose pliers, and flat nose pliers. You could alternatively use an appropriate 3-in-1 tool, which combines the functionality of the 3 basic tools into 1 convenient tool. The Jewelry Making Starter Kit is a complete jewelry making kit for beginners from Darice. This kit includes everything you need to get started designing your own jewelry at home! Kit includes a 3-in-1 jewelry tool, bead design board, fashion beads, spacer beads, findings, beading cord, illustrated instruction booklet and more. There are 151 assorted fashion beads in 4 colors and 106 metallic-look spacer beads. The 30-page instruction book contains jewelry making tips & ideas for designing your own unique jewelry pieces. This is an ideal jewelry starter kit for beginner beading crafters. Visit the Jewelry Kits section to see our complete selection of jewelry making kits. Getting started in jewelry making is easy with kits that include coordinated beads, findings, and instructions. Stop by Weekend Kits today and be ready to make jewelry on your next Weekend at Home!